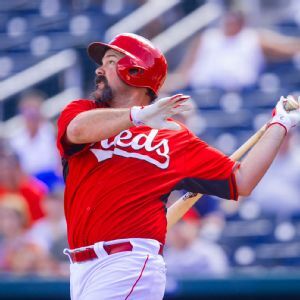 Corky Miller. It is the perfect name for who he is and what he is, a backup catcher. This spring, Miller is with the Reds. Most baseball reference books list his first name as Abraham. Pitcher Chien-Ming Wang was among 10 players who agreed to minor league contracts with the Cincinnati Reds and will report to big league spring training camp. The Reds have reached agreement with catcher Brayan Pena on a $2,275,000, two-year deal, giving them three catchers on the roster. The Cincinnati Reds have included speed outfielder Billy Hamilton on their roster for Tuesday night's National League wild-card game against the Pittsburgh Pirates. Speed has certainly not been used as a weapon this season in Cincinnati. Although the Reds rank first overall in the National League walks, meaning they've certainly had their share of baserunners, they rank just 14th in the NL in steals. Catcher Ryan Hanigan was off the disabled list and back in the starting lineup Friday for the Cincinnati Reds, who took another step closer to getting their lineup intact. The Cincinnati Reds have put catcher Ryan Hanigan on the 15-day disabled list with a sprained left wrist. The Reds activated catcher Ryan Hanigan off the disabled list for the start of a series on Friday night against the Milwaukee Brewers, getting them a little closer to full-strength.